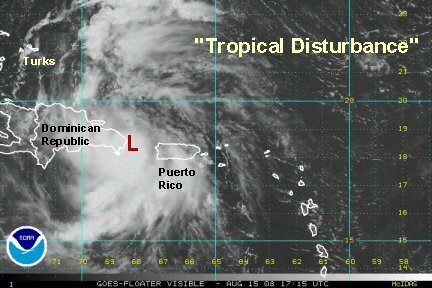 How this "tropical disturbance" has not been classified as of yet is bewildering. 1) The radar shows rotation near the coast of the Dominican Republic. 2) Quickscat showed a low level circulation earlier this morning. 3) The latest recon reported a flight level wind (1000') of 37 knots. This system should be classified as a depression at least. The "disturbance" is now heading into the Dominican Republic which will disturb its organization, so it may take another 24-36 hours for NHC to take action here. The good The forecast models now mostly take the tropical system over Hispaniola then Cuba before recurving over Florida or the Bahamas. Because of this, there will be a limited time over water for it to organize. The bad 1. The system still has a huge amount of moisture with it, so flash flooding and mudslides are likely on Hispaniola then Cuba. 2. There is still potential for this system to become a hurricane and affect the U.S. The forecast models now recurve this system anywhere from the eastern Gulf toward Tampa to recurving in the Bahamas into the Carolinas.....A big window. NHC is very unpredictable sometimes. 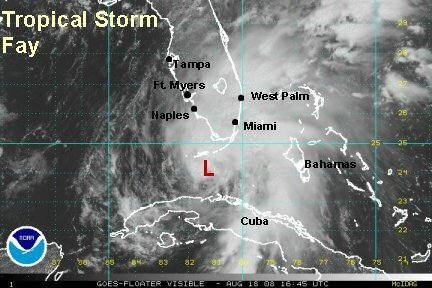 The "tropical disturbance" was upgraded directly to storm status.....over land. A more amazing feat will be the official forecast. The NHC forecast calls for a track down the spine of Hispaniola to Cuba then over the Florida straits into Florida. While we agree that this is the mostly likely track at this point, They keep Fay a tropical storm the whole time. At minimal tropical storm strength of 40 mph, it is very unlikely to traverse the high mountains of Hispaniola without weakening. 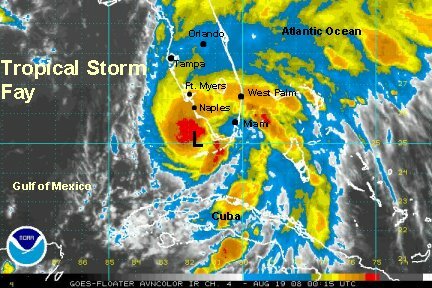 Storm strength is predicted as it continues over Cuba. If indeed this track is correct, it would be more likely be a tropical depression. If Fay emerges over water more, then tropical storm strength is possible. 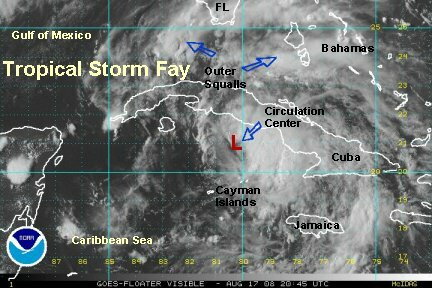 In fact it is likely that Fay will lose some strength over the mountains, then regain strength as it passes Haiti. The main concern for Hispaniola and Cuba will be heavy rain with the potential for flash flooding and mudslides. 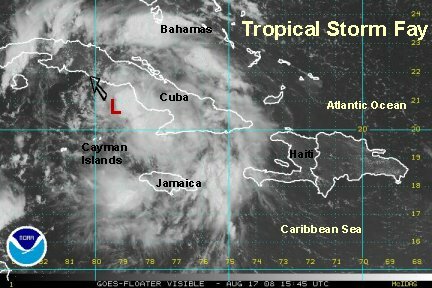 Interests in the Bahamas and southeast U.S., especially Florida should follow Fay. 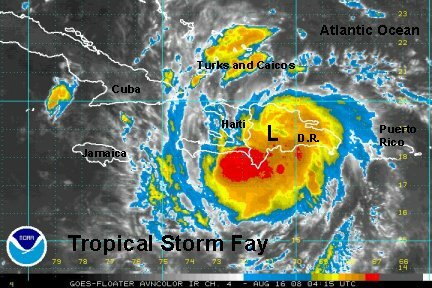 Fay is centered over southwest Dominican Republic a few miles east of San Juan, D.R. As we mentioned in earlier updates, the models simply can't be trusted until they know where the center of the surface low is. The models kept the low <b>north</b> of the Caribbean islands and came up with a track recurving mostly over the Bahamas. We now know where the low is and so do the models, so it shouldn't be a surprise to any of us that the track was shifted farther west due to the initial surface position farther south. This means that the models should have a better handle on the situation. At this point if appears that the west and north coast of Florida will be of greatest concern to us. 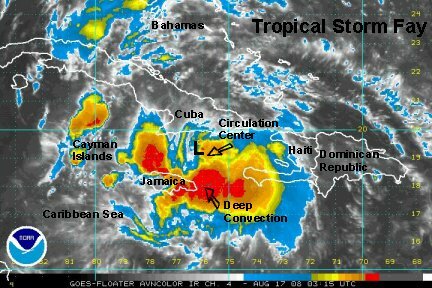 In the short term, expect heavy rain to cause flash flooding over Haiti and the D.R. into this afternoon. After that, the exact track will tell if we'll be dealing with a sizable hurricane in the eastern Gulf of Mexico or something smaller. Cuba wouldn't disturb the circulation as much as Hispaniola if the circulation center moves across the country. If Fay stays south of Cuba and over water, we could be dealing with something much stronger. The upper air pattern is very favorable for development also. The time frame is into the Gulf about Monday, near or offshore of the west coast of Florida Tuesday, then landfall Tuesday night or Wednesday. Keep in mind that the models have been shifting around, so we need to see if there's consistency with a few model runs. It's a good time to go over your hurricane evacuation plans and make sure you have needed supplies in case Fay visits west or north Florida. NHC mentioned in their last advisory that they didn't know exactly where Fay was. We'll that's true. 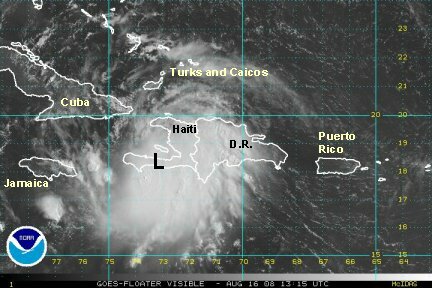 If anyone on the networks say they do, they're not telling the truth......We have estimated that Fay is over the southern peninsula of Haiti with the latest Quickscat and visible satellite imagery. Because of Fay moving over the mountainous regions to the east the surface low was no doubt disrupted. We should have a very good idea where the center of circulation is soon as Fay moves over the warm Caribbean Sea waters west of Haiti. Fay is likely to be a hurricane before moving into Cuba. It may even brush northern Jamaica. The forecast tracks are getting a bit more stable with a slight nudge to the east again. The media - tv and internet have made the "spaghetti charts" readily available to the public. IMO this is not a good thing to do. In a discussion with my colleagues last night, I mentioned that it gives false clues to the public. Some of those models don't have much of a chance of being right. There are usually 2 or 3 that perform the best and another couple of good performers that aren't even on the charts. Anyhow, an extremely tough forecast with intensity and landfall likely will be coming up. Does anyone remember hurricane Charley? There was a lot anger expressed by folks on the west coast of Florida for a poor forecast. Actually the forecast was pretty good. When a hurricane is moving northward on the Florida west coast even a slight angle change can mean the difference between a landfall in southwest Florida or Apalachee Bay. And of course a huge difference in landfall time of days goes with that forecast also. Right now NHC is going with one of the better models just offshore of the west coast. If that is the case, the tropical cyclone can remain strong delivering surge all the way up the west coast of Florida. We'll reevaluate with the new models later today...when we know exactly where Fay is too! The toll on Fay is now very apparent. The mountains of Hispaniola disrupted the circulation and only now looks to be on the comeback in the Windward Passage. Fay was centered near 19.3 N / 75.2 W per the last Hurricane Hunter fix. Deep convection is disorganized and mostly south of the surface low. This weakening phase is now over though. Conditions aloft are favorable for strengthening. Fay will start regaining strength before making landfall in central Cuba. The better models are split after that. Most of the models still have Fay moving up the west coast of Florida. There is one other calling for a farther east track up the east coast. 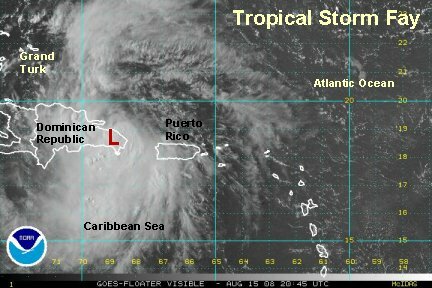 That's the model that picked the southern route for Fay while all the rest said north of Puerto Rico. So because of this track record it's hard to want to commit to the west Florida track yet. We'll gvie it another model run or two to see what happens. Overall not much has happened so far today. We'll look at the models this evening and see if Fay starts its restrengthening phase as anticipated. It's a good time to go over your hurricane evacuation plans and make sure you have needed supplies for Fay's likely path to Florida. A Hurricane Hunter vortex fix and Cuban radar imagery now show the slowly reorganizing surface low of Fay at 19.4 N / 76.3 W. Deep convection is building mostly to the south between Jamaica and Haiti. It appears that the mountainous terrain of southern Cuba may be blocking inflow to the system. As Fay continues to move west - assuming it stays off shore of the southwestern tip of Cuba should encounter a more favorable environment for strengthening. Essentially all forecast models move Fay inland somewhere between western and central Cuba. After that, nearly all the models now take Fay just offshore of the western coast of Florida with various landfall positions from southwest Florida to the north Florida coast. Two of our favorite models are the farthest east still - southwest to the lone outlier to southeast Florida. We'll take one more look at that models next run to see if there is any continuity, if not we'll dismiss it. So hopefully after tomorrow mornings model runs well have a better idea of the track. Briefly, as we mentioned earlier, with Fay approaching the west coast of Florida in such an oblique angle, a small change in course will mean the difference between a landfall in Naples or Apalachee Bay. 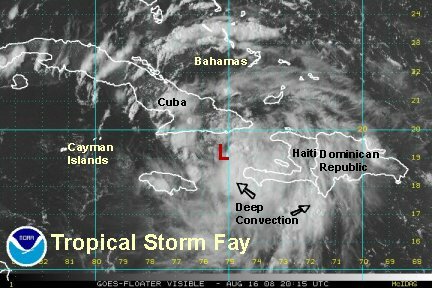 Fay actually looks less organized now as westerly wind shear is disturbing the development. The deep convection that was building earlier this morning has become less impressive. In fact top winds probably are no longer 50 mph sustained as it was earlier today. In reality, top sustained winds are probably 40-45 mph - a minimal tropical storm. This means that Fay will make landfall late this afternoon or evening in Cuba as a tropical storm. 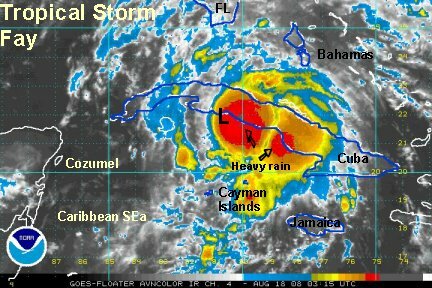 The main effect to Cuba will be heavy rain. It is interesting to note that the Hurricane Center moved their track slightly east, a little closer to where we think landfall may occur in southwest Florida. They also have Fay becoming a minimal hurricane at landfall. Probably a good call, even if Fay is weak now, there is ample time for it to become a minimal hurricane before landfall. NHC also acknowledged some of the models taking Fay off of the Space coast then making a second landfall in the southeast U.S. This is why they nudged their track farther east - the same reason we did earlier, the best models have a farther east track. The latest forecast tracks are in and almost all have shifted some west...again. The models were moving west a few days ago, then started moving east, now west again. This is extremely problematic. As we explained before, anytime a tropical cyclone approaches the Florida west coast from the south, a small deviation in direction can have dire consequences on landfall position and intensity (aka Hurricane Charley). Most of the models have shifted to a landfall now near or north of Tampa. The Euro takes Fay into southwest Florida still. It heads off of the Space coast, then turns around for a second landfall on the Space coast....then moves over northwest Florida- wow If the models are correct and keep Fay just offshore to near Tampa, it will have a chance to strengthen and will also pose a problem with a tidal surge up the west coast. Right now Fay is just south of the Cuban coast. It is finally getting better organized just before landfall later this evening. Some outer squall have already moved north of the Keys, so locally heavy rain have already started to come in. BTW- As Fay crosses Cuba, there will probably be only a small effect. The western part of Cuba is flatter as opposed to the more mountainous regions of central and especially eastern Cuba. Check the official NHC advisory - changes have been made to update watches and warnings. Fay's forecast becoming more uncertain? ....you would think so by looking at the last "spaghetti plot" of Fay's forecast tracks. Our model outlier the Euro is now recently being joined by another reliable model. Our favorite models are the farthest east. A couple of the models that we like the best are calling for a landfall south of Tampa sometime Tuesday. Obviously if the track is farther south it will be a early Tuesday landfall or if closer to Tampa a later Tuesday landfall at its present speed. It is also interesting to note that both of the more reliable models take Fay off of the east coast of Florida briefly then back west for a 2nd landfall. One has a second landfall near JAX the other on the Space coast. A JAX landfall would be extremely rare! This forecast goes on to take Fay <b>west</b> again through the Big Bend of Florida, back into the central Gulf where it then makes a 3rd landfall near Pensacola <b>next Wednesday</b> August 27th Now you know why you shouldn't trust the models! It would be an amazing feat for the model if this actually occurred. As we mentioned earlier, we think it is a disservice to show the "spaghetti plots" on major media. There are just too many media people without experience to explain or know how to interpret them properly. The public sees the charts and naturally want to pick a "down the middle scenario" or pick the track which they want to occur. Well, it looks like out favorite models have been the bloodhound models and are sniffing the right track. Even NHC has been biased too far west because of the "spaghetti plots" instead of going with the more reliable ones farther east. Both ot the more reliable models have Fay crossing the Florida peninsula and making a second landfall in east central, FL or on the GA coast. The radar and satellite show a broad area of low pressure, it looks like the low is south of Key West in the Florida straits. If this position is correct landfall will be in southwest Florida. We should know for sure in a few hours. This just in....NHC's new advisory is farther east bringing it in near Venice, but not going with the "off the east coast scenario" yet , They have top winds at 60 mph. This is too high. Probably 45-50 with squalls approaching the Keys. 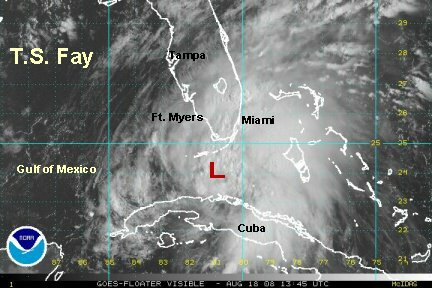 The latest radar and satellite show the center of Fay just south of Key West. It will move over Key West in the next 2-3 hours. Fay is getting better organized with heavy rain and squalls heading over Florida Bay and south of the Keys. Doppler radar estimates over 5" south of the Keys, so heavy rain of 5"+ is possible over parts of south Florida that get the heavier rain bands. It looks like Fay is on track for a southwest Florida landfall near Naples or maybe Ft. Myers. The low is starting to get better defined on radar, so the exact center will be able to be tracked better soon. Our favorite models still take Fay into southwest Florida then off of the east coast barely, then back west to north Florida or Georgia. The other "spaghetti plot" models are now moving east too. It pays off to go with the more reliable models again! The media has started their over hyping of Fay and look almost "giddy". We try to cover hurricanes in a sensible way - without hype, because hurricanes can hype themselves. NHC retracted their landfall time of 3 pm at Key West and posted the landfall time about 1 1/2 later. The latest radar and satellite imagery show that Fay's structure is looking more impressive. the northern part of the circulation is solid with very heavy convection. This is what is trying to become an eye wall. If it wraps around, then that's when significant development will occur. The south side of the circulation is just starting to develop scattered showers. At this point it still looks like a landfall in southwest Florida. We have been following the couple of models that had a good handle on this since yesterday. Right now the Ft. Myers (Sanibel) area still looks to be the general region. It could just skirt the coast near Marco and Naples by tomorrow morning. We do expect a northeast turn. If the turns occurs late, it may make landfall a little farther up the road near Venice later Tuesday. The longer it lingers over the water, the more time for it to strengthen. Doppler radar has estimated that 8"+ of rainfall has occurred in the bands south of the Keys and now over Florida Bay. Locally 5"+ over the Everglades. Some totals of 10"+ will be likely in south Florida before this is over. A huge help for the dry areas! 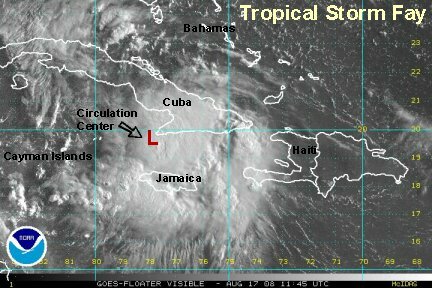 NHC and the other models are now getting closer to the two that we have been following. A northeast turn off of the Space coast north of Cape Canaveral then a turn to the west. One model takes it over the Big Bend still and out into the Gulf, then north into the panhandle again.....Remember the scenario that we mentioned yesterday We'll the model is still calling for it. Our other favorite model makes the west turn farther north into Georgia. Both have generally the same idea though. They move Fay northeast, then the high builds in strong again to send Fay west or southwest. Either way, FAy is going to be around for quite awhile. The main concern now is with heavy rain. As mentioned before 10"+ is possible in south Florida ( 5"+ has already fallen). Isolated tornadoes are possible and power outages near the track of the low. Storm tides will be coming up tonight as Fay approaches the coast....3-5 feet but could be higher if Fay strengthens. It is a rare case. You just don't see tropical cyclones develop over land. Or is it really? 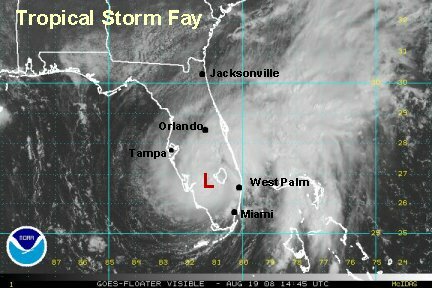 Fay is centered about 10 miles north of La Belle on the west side of Lake Okeechobee. With being over the Everglades and with recent heavy rain, Fay is behaving as though it's over water....because it esentially is. Fay's radar presentation has never looked better and an eye wall structure has formed. With this being the case, Fay may actually be a 60 mph tropical storm. (Earlier we said that 60 mph was too high) There was only one other time recently that this occured...it was several years ago when a tropical system strengthened over eastern N.C. after flooding rains preceded it. Again that was a similar scenario. Swampy area with heavy rain preceding it. South Florida has picked up a general 4-6 inches of rain. Doppler radar has estimates now of 10"+. With the slow speed of Fay and it "returning track", it is possible to see 5-10" into central Florida too. The two main concerns with Fay are flooding rain and isolated tornadoes. The tracks of our favorite models have not changed much. A northeast motion offshore north of Cape Canaveral. A return visit to Florida or maybe Georiga around Thursday. It appears that the Florida track may be the better forecast, although we're not going to commit to that yet. If it is the track, rainfall will be compounded with the return visit. After that, as we mentioned a few days ago, there is a possibility of a western motion into the Gulf. We'll deal with that "phase" later. With the recent strengthening and organization over land, it just means that Fay will be more ready to develop further once is moves off of the east coast of Florida (barely).